Last night was day two of our two-week section on pastry. The French Culinary Institute believes that culinary students should have at least a background in pastry, and I couldn’t agree more. Take Top Chef as a prime example. Every season at least one, if not two, competitors get sent home for the ill-advised action of taking on a dessert course. We culinary students need to earn our chops in the fine art of dessert-making. I have an insatiable sweet tooth and while it usually craves chocolate, I am happy to oblige it with a couple of weeks of pastry crèmes, tarts, ice creams, mousses, soufflés, puff pastry and crepes. Unfortunately, I can feel my pants tightening just from writing that list. That, in conjunction with the aftereffects of a serious sugar high in class last night, left me craving something good for my body this morning (when I say serious sugar high I mean serious. By the end of class, no one could stop laughing long enough to listen to the instructor, and after I got home at 11:30 pm, it still took me two hours to be able to go to sleep). Luckily, in addition to the many food magazines I read, I also have subscriptions to a number of health and fitness publications. Someone who loves to eat as much as I do needs all the help she can get making sure she does not need to buy a new wardrobe every few months. 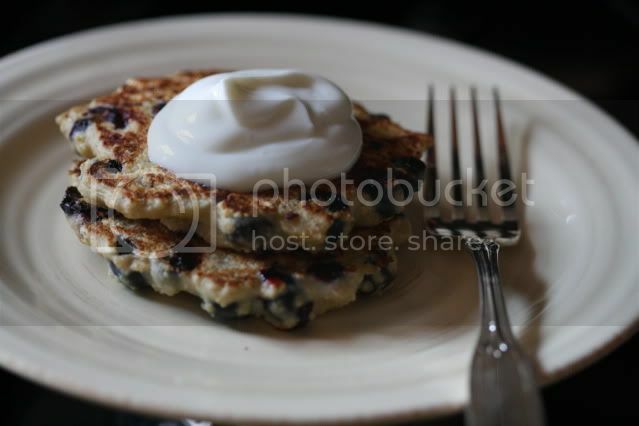 These blueberry pancakes are from Health Magazine’s September issue and a part of their new CarbLovers Diet. I am not someone who has ever in her life been able to stick to a diet (please see previous comment about loving to eat and did I mention I am in culinary school?). However, I do love to take some of the best, healthy recipes from publications like Health, Cooking Light, Family Circle and others, and incorporate them into my cooking routine to bring balance back to my meals. These blueberry pancakes are delicious and easy to make, a combination that should earn them a repeat appearance in your cooking repertoire. At least, if like me, you need a healthy addition to your diet every now and then. Combine first four ingredients (through vanilla) in a blender and process just until smooth (if you take it too far as I did with my first batch the pancakes will turn out gummy). Place the batter in a medium bowl and stir in the blueberries. Heat a nonstick skillet over medium heat and coat with cooking spray. Spoon a few tablespoons of batter per pancake into the pan. Cook until golden, about three minutes per side. Combine the yogurt and the agave or maple syrup and serve with the pancakes. LOVE healthy pancakes. These look like they will not disappoint. I feel your pain... we food lovers need to strike a balance somehow! I thought you were joking about healthy at first, those pictures certainly don't look healthy. But reading the recipe changed my mind. Look great, I'm going to have a new breakfast dish soon. Yum. This is my kind of healthy. wow these pancakes look delicious! 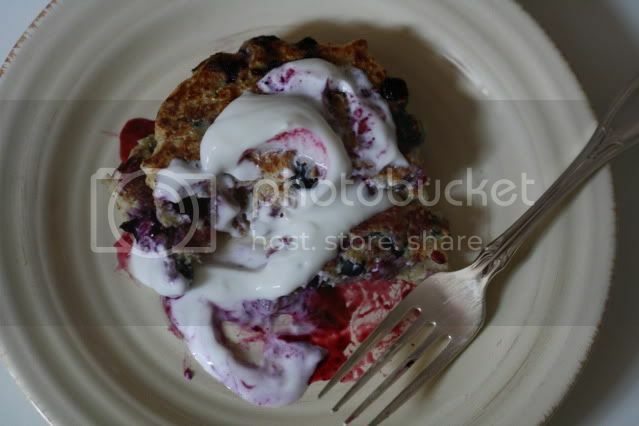 love that you top it with a good dollop of yogurt, yum! These look delicious. I will definitely try them! They look great, and I plan to try them too. I must admit though, that I was a bit surprised to read on the linked recipe "Because this dish takes some time to prepare...". Even for breakfast, 10-15 minutes of cooking is not much time! I've been going through a bit of a pastry, or more correctly, "sweet-tooth" splurge recently and realised that I need to calm down. This healthy approach to a pancake looks like just the thing. Thanks!